We Have Been Locally Owned & Operated Since 1958! When the fate of your refrigerator, stove, washing machine or dryer is in the hands of an appliance repair technician, it is safe to assume you want them to be good at their job. Kitchen appliances are among the most critical for our daily life. If one experiences a problem, it can throw your entire life into chaos. Fortunately, we have tips to share about what you should know when looking for an appliance repair technician. Before you ever make the first phone call to a repair service, you should do your research. Ideally, you can get recommendations from family, friends and co-workers. If this is not the case, your next best bet is to read the online reviews of any company you find in your search. Popular review platforms include Google and HomeAdvisor. Do not just look at the number of stars an appliance repair technician has. You should also read each review to see why they were given the rating. Avoid any company with more than two or three negative reviews, but at the same time, be wary of service companies that have no negative reviews at all. If some of the positive reviews strike you as fake, chances are, they were not written by customers. Once you have narrowed down your choices and you begin placing calls, pay close attention to the level of customer service you receive over the phone. Red flags include companies that do not return your call and employees that seem impatient with your questions. You should probably steer clear if you are given a large window of time or no window of time at all for the technician’s arrival. A reputable company understands that you have a life and they will do their best to accommodate your schedule. For example, they may give you a two-hour window instead of making you wait around all day. There is a dizzying array of appliance brands and models, and appliance repair technicians cannot be expected to have worked with all of them. However, they should have at least a basic level of knowledge about each manufacturer and model, as well as, how the manufacturer specifies they should be repaired. Some appliance technicians only specialize in certain brands and if that is your brand then you are perfectly fine. Just make sure their skill set is broad enough to apply to other brands you may have in other appliance categories. Essentially, even if your appliance is not one of the brands they typically repair, they should still be able to do the job well. This includes addressing any plumbing and electrical issues related to the repair. Think about it: Appliances use electricity and some are hooked up to your plumbing system, as well. They should possess the experience and training required to make all necessary adjustments and not destroy your electrical or plumbing connections. Otherwise, you could end up with a shorted fuse, burst pipe or an even worse crisis you did not have before the appliance repair technician arrived. At Area Appliance Service, we treat your appliances as if they were our own. Family owned and locally operated since 1958, we have built a solid reputation servicing Arlington Heights, Buffalo Grove and surrounding areas. We are trained and experienced to work on major brands including but not limited to Maytag, Whirlpool, Kenmore, LG, Samsung and GE. Committed to excellence, our appliance repair technicians have continuously expanded their skill set to meet our customers’ needs. Providing great customer service is important to us and we strive to demonstrate this in many ways. We show up on time because we realize your time is valuable. If you end up in an emergency situation outside of our normal business hours, we offer emergency service 24 hours a day, seven days a week. Part of good customer service is being upfront about costs, and to this end, we give you a clear explanation of the issue that needs to be fixed and how much it will cost you. But do not just take our word for it! 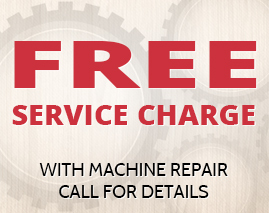 Give us a call today at 847-459-8070 to experience the Area Appliance Service difference for yourself.